Today's blog post is dedicated to my brother and his family, who are travelling to the island of Hawaii (Big Island) today for vacation. It is the first time he has been back to the Big Island since he was a child and the first time for his wife and their children to experience this incredible place! The island of Hawaii has been a favorite of Rick's and mine since moving to Oahu and we are so happy that my brother, his wife and their kids have the opportunity to stay there. The figure is flashing the Hawaii hand gesture for "Hang Loose" known as the "shaka". Rick painted his tattoos on his chest and arm. 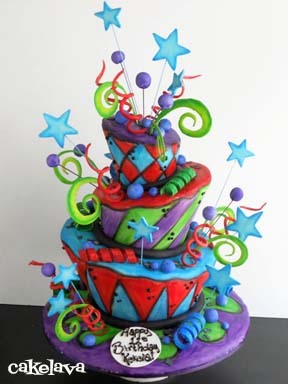 We love all the custom elements on this cake. 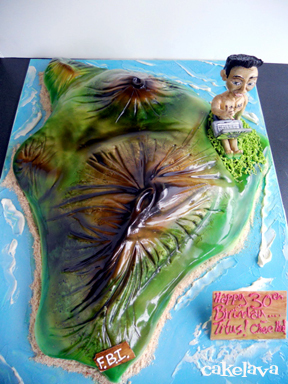 It was delivered to Uncle Bo's Restaurant, a hip local bar and eatery near Waikiki and had a lot of heads turning when we brought in the cake to their private party room. Thank you to our client for giving us the opportunity to make this special cake and to virtually revisit one of our favorite places! Last week we announced two new locations where Rick would be teaching his "Discover Your Inner Artist" class - one in London and one in Pennsylvania. If you are looking for information on either class, please refer to our "Classes" page on the blog. Having the new classses certainly added to the excitement here, and as students started signing up, we were also heavily focused on an elaborate three and a half foot handcrafted floral and damask print wedding cake for the weekend. Throughout last week, Rick worked on the flowers, shaping the tiers, painting the damask print and planning the delivery. This cake weighed a ton and took the strength of both of us to lift it. 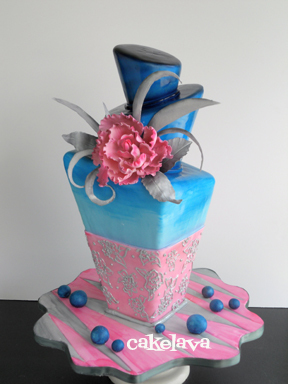 Every tier was made of cake, except for the vase topper and did I mention it was heavy! The cake looked absolutely gorgeous in person! The royal and navy blue colors were a beautiful contrast with the white accents. The feminine hourglass shapes alternated with more traditional rounds and the unadorned tiers were complimented by the tiers with the damask print and romantic roses. We were greeted by the family and the groom and they thought the cake was beautiful and were excited for the bride to see it, as were we. Congratulations to our couple! Thank you to everyone who has contacted us inquiring about Rick's "Discover Your Inner Artist" cake classes in their region. We would love to come and visit all of you and have Rick teach in your location, but we have a tightly booked calendar in 2012. Between working on our book, cakes, and already scheduled classes in a number of locations, Rick will not be booking classes at other U.S. cities in 2012 besides Allentown, Pennsylvania at the Mother of Cakes: Sugar and Cake Academy on September 13th, 14th and 15th, 2012. If you are able to commute to Allentown, we would love to meet you. The class has been announced over a year in advance to accommodate those needing to travel or save for the class. We hope to see you in September 2012! "Discover Your Inner Artist" 2012 Class at Exotic Fantastic Cake Decorating School, London, UK! It has truly been one Fantastic week and we are chuffed to bits! On Tuesday we announced that Rick would be teaching his very popular "Discover Your Inner Artist" class in Allentown, Pennsylvania in 2012 at the brand new Mother of Cakes Sugar and Cake Academy, and within days we have another location for the class, this time crossing the pond into London, England at Exotic Fantastic Cake Decorating School! It's coincidence that both classes were announced this week and it added much excitment to an already busy work week! Our passports are getting a work out in 2012! First Canada in June to premiere "Discover Your Inner Artist 2" then over to London, England, right around the time of the Summer Olympics, then on to Pennsylvania. It's thousands of miles each time and an unmeasurable number of opportunities to experience another place! Now onto the details for the London class! The dates will be Thursday, Friday and Saturday, August 16th, 17th and 18th, 2012 at Exotic Fantastic Cake Decorating School in North East London. Yes, 2012, not 2011. We will be staying put this year while we work on our book and client cakes. Rick will be teaching his signature hibiscus with bamboo and sculpted clownfish cakes shown above which he premiered in Canada in March 2011 in two classes. The first Canada class sold out in 48 hours and the second one also sold quickly. Rick was promptly booked to return next June. In his "Discover Your Inner Artist" class, students will learn Rick's highly sought after art methods including sculpting, hand painting, airbrushing and other freehand art techniques without the use of molds, cutters or stencils. By the end of the class students will have learned how to tap into their inner artist and have two beautiful completed cakes. We welcome students from all over Europe and beyond to take the course. Exotic Fantastic Cake Decorating School is handling all registration and any travel related questions you may have in relation to the course. Installment payments are an option. Our host has been awesome to work with and she is very excited to sponsor Rick as her first "celebrity" cake artist from the United States and we couldn't be happier! To register, please follow this link on the Exotic Fantastic Cake Decorating School site. The class is already starting to fill up so book your spot today! 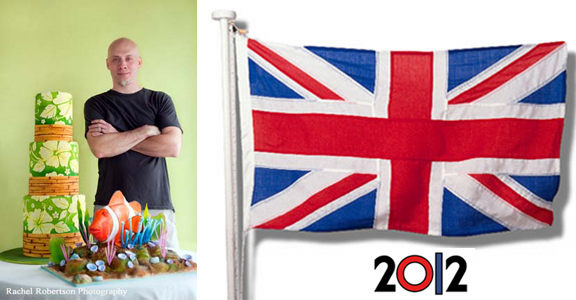 See you in London 2012! In case you missed our links to class reviews posted by previous "Discover Your Inner Artist" (Canada 2011) students, we have included them again for your enjoyment! Thanks once again to our awesome students for sharing your experiences with us and others wanting to take the course! With Rick's newly announced "Discover Your Inner Artist" class at Mother of Cakes: Sugar and Cake Academy in Allentown in 2012, the state of Pennsylvania has been on our mind. What better time to share a reccent sculpted groom's cake Rick made for a diehard Pittsburgh Steelers fan. 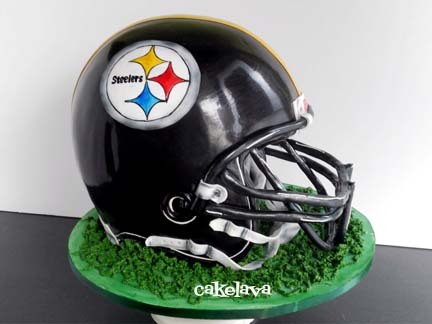 We are starting to build up a nice collection of sculpted football helmet cakes in our portfolio, but this one is our first black colored helmet and also the first one of the Steelers. The helmet is made completely from cake and the headgear and props were made by Rick. The wedding cake that sat beside this surprise groom's cake was a soft pink-ish purple color with flowers, adding a lovely, feminine quality to an otherwise masculine cake table. Congratulations to our couple! We have been blessed with the opportunity to come to the East Coast in September 2012, where Rick will be teaching his popular 3-day "Discover Your Inner Artist" class at the brand new "Mother of Cakes: Sugar and Cake Academy" in Allentown, Pennsylvania. We can't wait to come to the East Coast, where Rick and I both have ties, to offer the experience of learning his signature hibiscus and bamboo wedding cake and sculpted clownfish cakes to interested students. 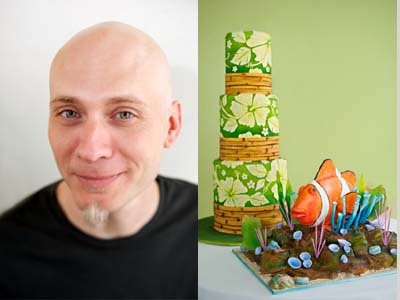 This is the first time that Rick will be teaching his "Discover Your Inner Artist" course in the United States and we are honored to have been asked by Mother of Cakes: Sugar and Cake Academy to be one of their first featured cake instructors! Over the course of 3 days, on the dates of September 13th, 14th, 15th, 2012, students will learn how to discover their inner artist as Rick demonstrates painting, airbrushing, sculpting and freehand art techniques all without the use of molds, stencils or cutters. At the end of the course, students will have two beautiful completed cakes . The class was announced less than 24 hours ago and we already have a number of students excited to take the course! The same course was offered in March 2011, when Rick made his teaching debut in Kitchener, Canada and sold out in a matter of days. We are anticipating this class to book up quickly and bring students from the tri-state area and entire East Coast, and beyond! Please contact Mother of Cakes: Sugar and Cake Academy directly with any questions about payment plans , travel information, or further information on the course. Below are some blog links written by Rick's "Discover Your Inner Artist" students in Canada earlier this year. Many thanks to our wonderful students for taking the time to share their experiences in the class! Hope to see you in 2012! Forget about brewing that cup of espresso today. You're not going to need it. If this cake doesn't give you a caffeinated "jolt" I don't know what will! For Kekela's 12th birthday, Rick took color and whimsy to a super-charged level. The cake was like a Suessian dream and the color combination worked beautifully. We were given the color choices by the client. "NO pink, NO pastels." Colors to include blue, purple, red, green and black. At first I thought "Now how is Rick going to pull off this challenging combination?" but all it took was leaving him alone with his wild imagination and letting him do his thing and this was the result. When the cake was delivered, jaws fell to the floor and even though there was only a few women around at the time of delivery, with the level of enthusiasm and excitability in their voices, it felt like the room was full of people. They loved how crazy and fun the cake was and I have to admit I was a little sad to see this one go, but happy that it went to such an appreciative group! One of our new favorite Candy Land themed cakes, Rick made this adorable cake for a 2 year old's birthday party last weekend. Our client flew in from Las Vegas to celebrate with her family and friends and requested a Candy Land theme with lollipops, ice cream cones, peppermint candy and the Candy Land sweets trail, and she got all that she asked for, and more! Rick made all the candy by hand, and included a large variety of goodies on the cake. Both the client and Rick felt "old school" was the way to go for the design. Not knowing in advance what her little girl's cake would look like, our client was so excited when she saw the cake and couldn't wait to show it off at the party. She chose flavors both sweet (Hot Fudge Sundae) and tropical (Guava Lava) for the cake. 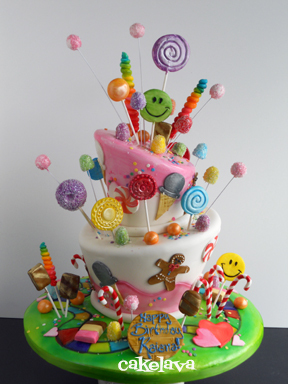 I love the addition of the happy face lollipops and that is exactly how this cake made us feel. Happy! I have consumed and slurped hundreds of bowls of ramen in my life. In fact, I'm craving a big bowl of it right now. Going out for ramen is one of Rick's and my favorite dining experiences. The smells of ramen are both intoxicating and soothing. Our wedding couple Jenny and Tim, who were married last weekend, also have fond memories of enjoying a bowl of ramen together and sent us photos of a trip they took to Japan a few years ago. 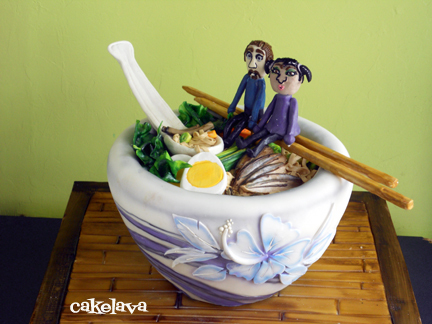 This became our source of inspiration for their fantastic, definitely one-of-a-kind wedding cake featuring their "Wii" Mii likenesses sitting on the bowl on a pair of chopsticks. 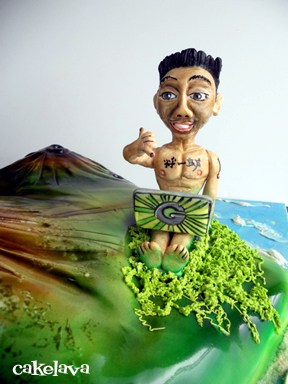 This cake design was a wonderful collaboration between Rick, Tim, and Jenny. When it was decided that the couple wanted to go with a fun, unconventional design, they asked for their Mii's to be added onto the cake because their Wii console was one of their first investments together. 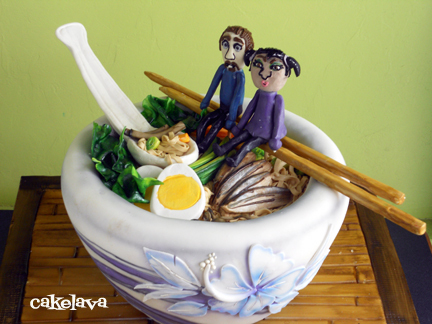 We loved the idea and thought it added the perfect element of whimsy to the realistic bowl of ramen. The bowl that the ramen is served in was also designed especially for Jenny and Tim's wedding. The couple's wedding colors included lavender and on their wedding invitation was a wave graphic, which Rick incorporated into the bowl, as well as a hibiscus flower, which would honor their Hawaiian wedding destination. Jenny and Tim were married at Lanikuhonua, a gorgeous property in the resort area of Ko Olina, Oahu. They selected our yummy guava cake to serve their guests. The wedding was exquisitely coordinated by Dianna Shitanishi of Hawaii Weddings and Events and catered by Gourmet Events Hawaii and Poke Stop Catering. Su-V Expressions did a beautiful job on the flowers and photographer Frank Amodo captured Jenny and Tim's special day. Thank you to Tim and Jenny for bringing us such a fun theme to work with and for their contributions to the design! Congratulations! Now we're really hungry for a bowl of ramen! Rick and I had a chuckle when we got the call from a local dentist, wanting to order a cake for her husband, an endondontist. It was an unfortunate case of art imitating life, because Rick had recently had his first experience in an endodontist's office when he went to get a root canal. I would never use the words "lucky" and "root canal" in the same sentence, but in this case, it was fortunate that Rick had the root canal because it made him more familiar with the process and gave a more realistic representation of how to make a tooth cake fit for an endodontist. Our client (the dentist) came into our studio and brought us visuals of how the tooth was supposed to look, during a root canal, as well as the endodontic probe. Since her husband Wade was celebrating his 50th birthday, she requested for the number 50 on the probe. As I sat at the table with Rick and our client discussing the root canal tooth cake, I was thankful that I would never have to go through that experience. Then a strange thing happened a month after we delivered the root canal cake to the endodontist. This time it wasn't a case of art imitating life but rather life imitating art, and after a trip to the dentist, I too found out I needed a root canal because of a previously impacted wisdom tooth that had pushed up against a molar. 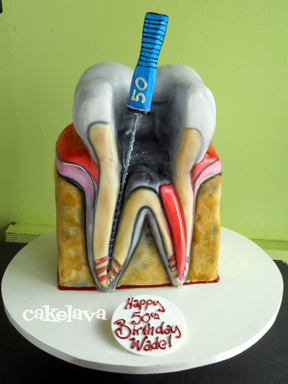 I was absolutely terrified of the procedure and decided to hold off on showing the root canal cake until I had gone through it and didn't cringe when I looked at the cake. at it because the timing was pretty funny and perfectly indicative of LIFE! You just never know when you'll have to face your worst fears, and then make it out of cake. 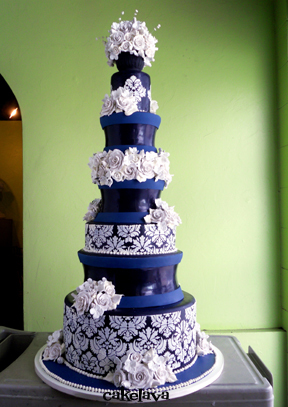 We met with Leslie and Arnold last Fall to design their wedding cake. We knew shortly after we started talking about their wedding colors and design style that their cake was going to be flamboyant and fun! One of their wedding colors was pewter, which is somewhat unusual, and obviously one of the bride's favorite colors because she was wearing a pewter colored shirt and carried a pewter handbag, and when we looked down, her shoes were also pewter. We knew pewter would definitely be included in the cake! Besides the colors midnight blue, pewter, and splashes of pink, and a romantic floral accent, the rest she left up to Rick's imagination. For Leslie and Arnold, Rick designed a very tall bottom tier with dramatic edges and two smaller top tiers in a rounded shape. A large handcrafted pink peony with stylized curvy pewter leaves was placed on the cake, adding a romantic flair to the design, along with a floral piped pattern on the bottom tier. Rick chose to do a wavy cake board to work with the shapes of the cake and accented the board with both fluid and sharp design accents. We love the way the cake looked and how all the different components came together -- fun, modern and romantic, all in one! Their wedding took place on the gorgeous grounds of the JW Marriott Ihilani resort in Ko Olina, in the Hokulani Ballroom, one of the prettiest on site. Many heads turned when we carried their wedding cake in and placed it on the pewter linen, amongst the pretty pink flowers and blue linen on the head table. It looked right at home! Congratulations to Leslie and Arnold!